DHARAMSHALA: The Education Council and Advisory Committee of Central Tibetan Administration held its 6th meeting today at Kashag Secretariat hall. 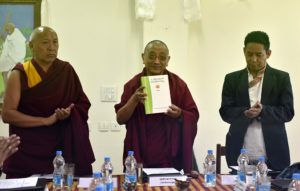 The meeting was presided by Chief guest, Kalon Karma Gelek Yuthok, Department of Education, Education Secretary Karma Singhe and Chairman, Education Council and Director of Library of Tibetan Works and Archives, Geshe Lhakdor, Education Council. In attendance were Director of Sambhota, Namgyal Yarphel, Director of Tibetan Children’s Village, Sonam Sichoe, Additional Secretary Tsering Samdup, Education Council, Head of Academic and Traditional Education, Tenzin Dorjee, Education officer at Tibetan Homes School, Mussoorie, Passang Dhondup, Teaching faculty at Central University of Tibetan Studies and Sarah College of Higher Tibetan Studies, Ven Lhakpa Tsering and Sonam Gyaltsen, Education Officer at Snowland Foundation, Tenzin Rabgyal and Education officers of Department of Education. In his inaugural remarks, Chief guest Kalon Karma Gelek Yuthok offered important recommendations on each of the resolution of the meeting. He spoke about the founding principles of the Education Council and the nature of the council as a ‘statutory body’ functioning independently, and not as a section of the Department of Education. He further offered insightful guidance on the various important activities of the two bodies. He particularly stressed on initiatives for asserting sound understanding of Secular ethics. The agenda for the two-day meeting include reviewing the resolutions of the 5th meeting, discussion on curriculum of primary and secondary schools, discussion on secular ethics in school curriculum, Montessori education and other discussions. The education council and advisory committee is composed of the director of Education Council, traditional and modern academic section head of Department of Education, director of Sambhota schools, education director of TCV and former principal of CST Mundgod, education officer of Tibetan Homes School, education officer of Snow Lion Foundation and Nepal Gangchen Schools. The education council and advisory committee are the chief decision-maker in the education system of Tibetan schools in exile.